An SEO audit is the first thing that you should do if you plan to boost your website’s search engine ranking and to fix most (if not all) SEO errors. An audit can be an overwhelming task and it might need a lot of time but a quick SEO review won’t take much of your time. It can be done quite easily with minimum tools. So why to conduct a quick SEO audit instead of a complete and detailed audit? Well, if you’re short on time and resources, a quick audit will do the job. The idea is to ensure that everything is working fine. Your website should have one and only one version accessible. To verify, insert all the URLs one by one in the browser that can be used to access your website. Only one of these URLs should be accessible. All others should lead to a 301 redirect leading to a canonical version. If your website is accessible via multiple URLs, it has to be fixed because search engine crawlers will struggle to figure out which is the right version. Monitor how your website appears in the search engines. Use following search engine queries to check the SERPs of your website. Or simply run a search query for your domain name. For instance, if your website is www.redapples.com, run a search query for ‘red apples’. Your website should appear at the top position with or without site links. If it doesn’t show up, there is something not right that has to be fixed. In order to see if your website and all its pages are indexed in the search engine, run following query. The resulting page will show all the indexed pages and posts on your website. Besides, look at the titles, description, and other factors. Anything that doesn’t make any sense or needs tweaking, get it fixed. There are two ways to inspect your website’s homepage. I recommend using both the techniques. First, use Moz SEO toolbar and see how URL, title, and other parts of the homepage look. See if everything looks on track. Second, visit the homepage in the browser, right click and then click View Page Source. This will show you the complete source of the page. If you’re not familiar with HTML, it won’t make any sense. In this case, you simply have to inspect the homepage manually. Does it look nice and friendly? Is there a single H1 tag? Do you’ve meta description that’s unique and describes the page? Are you using all the SEO best practices to make homepage SEO-friendly? Use Web Developer Toolbar to inspect alt tags. Make sure every image has a descriptive alt tag. Add alt tags for the missing images. The most crucial element on your website is the content. It has to be unique and well-written. First, manually inspect content and navigation. Can you easily find links to all the inner pages on the home page? Is there a link to homepage? Does it take more than 2 clicks to reach any page on your website? Do you add at least one blog post a month? Do you’ve legal and important pages such as contact, about, privacy, TOC, and others? The second step is to make sure that content on all the pages is unique. Duplicate content is your website’s biggest enemy. You’ll need Copyscape to check unique content. It won’t cost you a lot of money. You can inspect 100 URLs in as low as $5. If you’ve a small website with a few pages and posts, it will be a piece of cake to inspect all of them with Copyscape. However, if there are several pages, generate a free crawl report from Beam Us Up. Paste the crawl report in the Copyscape. It will check the uniqueness of all the pages. Fix any issues and proceed to the next step. Google Search Console and Analytics will only work if you’ve already activated them and you’ve been using them for a few weeks. SEMRush, on the other hand, works for all types of URLs. You can use its free version to get the basic overview of traffic. However, for deep analytics, you must switch to paid version. How much traffic your website receives? It is increasing or decreasing? Google Search Console will reveal organic impressions, clicks, search terms, and average position of your website in search results. See if your website needs any HTML improvements. Inspect your website’s index status. Google Analytics will provide better insights to all traffic sources, pages and posts that are doing better, bounce rate, etc. Is website’s organic traffic increasing, decreasing, or is steady? Are there any specific keywords your website is ranking on the first position? Is bounce rate increasing or decreasing? Which are the pages/posts with highest bounce rate and which ones have the lowest? These 5-steps will provide you with a quick audit report for any website. After going through these steps, you’ll understand the current status of any domain. 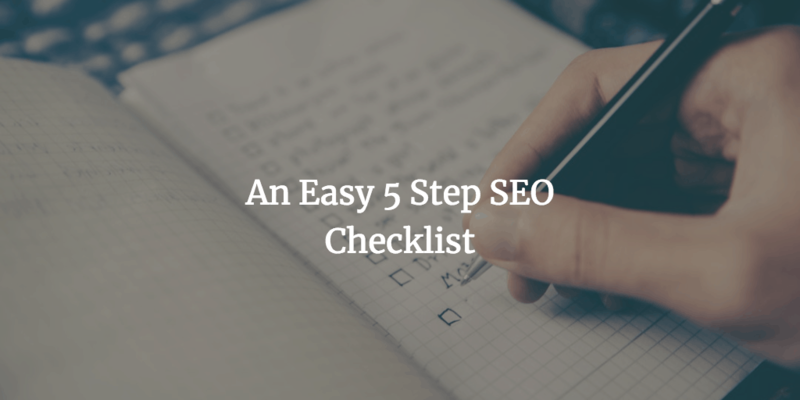 This 5-step quick SEO review is the starting point. Once you’re done with the basic audit, you’ve to move ahead and conduct an in-depth SEO audit that will reveal more insights. At the end of the day, it doesn’t matter how many audits you do but how you make your website better after an SEO audit is what matters. Tweak your website after the audit to improve its search engine ranking. If you don’t, it is pointless to spend time and resources on an audit.